I have to admit that I was a little less than enthused about this cheese named after a goat's foot. It sort of reminded me of some jellied Eastern European Dish Great Grandma Martha would have made in the old country. 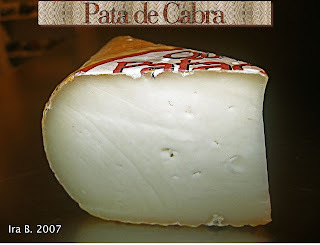 Fortunately, my Spanish is pretty weak so I was able to put this thought out of my head to try Patacabra, AKA Pata de Cabra, an aged goat's milk cheese from Zaragoza, Spain. Patacabra is shaped like a convex brick. It has a washed, edible rind and a very firm, smooth, cream colored center with some air bubbles. The rind is reddish when the cheese is new and brown when aged. The piece we had was more aged, and, as you can see, had a brown rind. The rind was a bit tough, and I would look for a slightly newer piece the next time I bought the cheese. Other than that the cheese is quite tasty. Although some may disagree, I thought it tasted like a very smooth Manchego cheese. Its very sharp. It would taste great with a strong wine and some figs or other sweet fruit. It was not badly priced at Zabar's, and may be available other places as well. 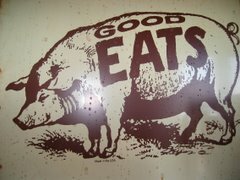 Cooks and Curds: A guy from Buffalo (also in New York, I am told) who writes about cheese and wine.